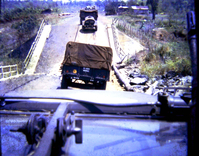 LK-14.jpgConvoy to nowhereThis convoy was headed to Cambodia....of course, we were never there in the first place. 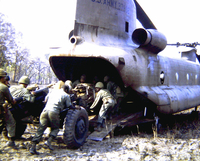 LK-2.jpgThe old wayBack in the early stage of the war, cannoneers had to manually push their howitzer into the rear of a Chinook. 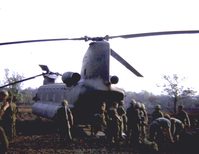 As time went by, the howitzers were slung underneath the Chinooks. LK-2x.jpgHeave-Ho!Pushing the cannon into the rear hatch. 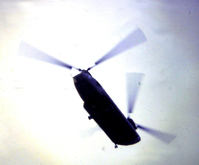 LK-2b.jpgLoaded and goingThe Chinook takes off with a bellyfull of cannon. 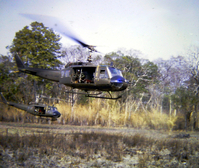 LK-3.jpgEveryone's photo targetBy far, the most common photos coming home from Vietnam were the Hueys, Chinooks, gunships and fixed wing aircraft. 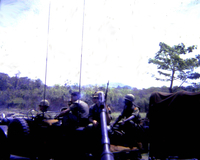 LK-4.jpgSp4 Larry KellerSp4 Larry Keller in stateside fatigues. Well, they ain't jungle fatigues, are they? Nope, the "early arrivals" were not very well supported with weapons, food and uniforms. That came later. 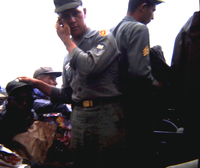 LK-5.jpgOpen marketIn many cases, the local civilians seized the opportunity to sell something to the GIs. LK-5a.jpgThird world countryPleiku taxi ride. 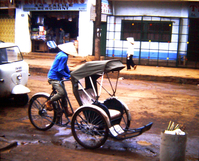 This is the way it was in most cities/villages in the 60s...excluding Saigon. 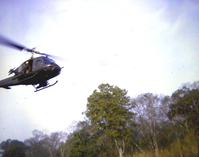 LK-6.jpgWe'll never forgetMain mode of transportation from start to finish: the Huey. 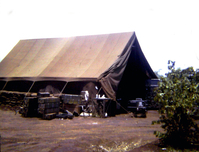 LK-7.jpgMaintenance Tent at the Pleiku BaseLarge CP tent were common in the early stage; not much protection from mortar attacks. LK-7a.jpgMontagnard LonghousesMost Vietnamese villages were mainly huts; the Montagnards built longhouses.